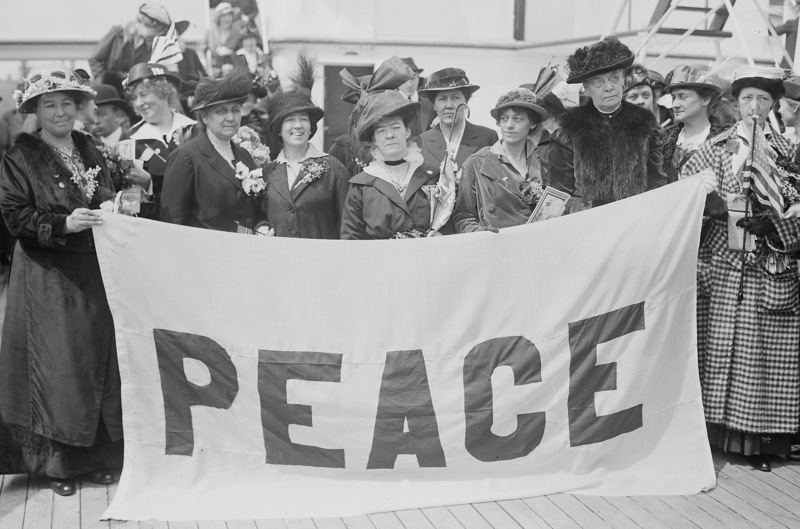 Female delegates to the 1915 Women's Peace Conference in The Hague, aboard the MS Noordam. April 1915. Source: U.S. Library of Congress. The debate about whether the United States should have fought in the Great War is practically forgotten today. Although the war began in August 1914, a broad coalition of antiwar forces tried to stop their nation from fighting in history’s most destructive war and, until April 1917, when President Wilson asked Congress to declare war on Germany, had succeeded. In the 19 months before the Armistice ended the war, 53,000 Americans died in battle, and the peace movement was suppressed. The United States won the Great War but lost the peace, leading to 30 years of genocide, massacres and armed conflict. Michael Kazin, professor of history at Georgetown and author of a history of the American left, believes that the second, more murderous war could have been avoided had the United States stayed out of the first war. Although Wilson spoke of “peace without victory,” American intervention encouraged the Allies, principally Great Britain and France, to hold out for a military victory over Germany. Like Germany, those nations had shed too much blood to be satisfied with an indecisive end to the war. The infusion of American forces broke the military deadlock. The Allies then imposed harsh terms on the defeated Germans, which lead to resentment, the desire for vengeance and the rise of Hitler. For almost three years, opponents of the war and military preparedness helped prevent Congress from massively increasing the size of the U.S. army, a measure favored by wealthy munitions makers and proponents of intervention including former President Theodore Roosevelt. Working against intervention were Socialists, feminists, labor unions, civil rights organizations, Congressmen from small towns in the South and agrarian Midwest, and new organizations including the Women’s Peace Party and the American Union Against Militarism. As late as the election of 1916, Wilson found it advantageous to run as the peace candidate, because these antimilitarists commanded public opinion. Several months later, however, Germany’s decision to resume unrestricted submarine warfare against neutral merchant ships persuaded him that war was the only option. The Zimmerman Telegram, in which Germany urged Mexico to invade the United States, also accelerated the movement toward war. Kazin focuses on four leaders who represented different shades of “the largest, most diverse and most sophisticated peace coalition to that point in American history.” Claude Kitchin, the populist Democratic House majority (and white supremacist leader) favored taxing corporations who profited from the war. Senator Robert La Follette, a Progressive Republican from Wisconsin, opposed arming merchant ships and spoke against businessmen with ties to Great Britain. Morris Hillquit, a New York Socialist Party member, led unionists against corporations eager to use war and preparations for war to increase their profits and power. Crystal Eastman, an editor, feminist and organizer, led peace marchers and supported antiwar candidates. Kazin shows how these leaders have been inaccurately labelled isolationists, since they established working relationships with European activists who espoused attempts to mediate the conflict in their own countries. Supporting their cause were public figures including Henry Ford, Andrew Carnegie, William Jennings Bryan, Jane Addams and Helen Keller. Despite Wilson’s suppression of dissent, many peace advocates credulously believed in his promises of a peace without victory. After Congress declared war, Wilson’s liberal administration created a propaganda agency to rally support for the war and a bureau to spy on dissidents who continued to oppose it. Although the antiwar movement lost the fight against intervention, they opposed legislation for a draft. But they lost that battle too, and its members risked prosecution by continuing to oppose conscription. The hammer of state power came down on groups who had in peacetime routinely expressed grievances about the authorities without risking a felony indictment. The movement never recovered. Despite Wilson’s suppression of dissent, many peace advocates credulously believed in his promises of a peace without victory. When Wilson announced his Fourteen Points in January 1918, “the big new speech sounded like something close to redemption.” Kazin believes that Addams, Hillquit and Eastman, who celebrated Wilson’s idealism, were naïve, if not delusional. The same president who waxed eloquent about “human liberty” was driving left-wing newspapers out of business and encouraging his Justice Department to prosecute peace activists. As the progressive Amos Pinchot put it, Wilson “puts his enemies in office and his friends in jail.” Moreover, Kazin writes that the Fourteen Points were in fact a “breathtaking act of realpolitik” aimed at encouraging Germans to lay down their arms so that Wilson could win the war on his own terms as quickly as possible. Although the philosopher William James sympathized with the peacemakers, he was not optimistic about their prospects. Writing in 1910, he believed the cause of peace needed the “moral equivalent of war” because war seduced as well as horrified; it was the mark of “the strong life.” Kazin’s perceptive history offers little reason for optimism a century later. This article also appeared in print, under the headline "The seductions of war," in the April 17, 2017 issue. Mark J. Davis is a retired attorney who lives in Santa Fe, N.M.